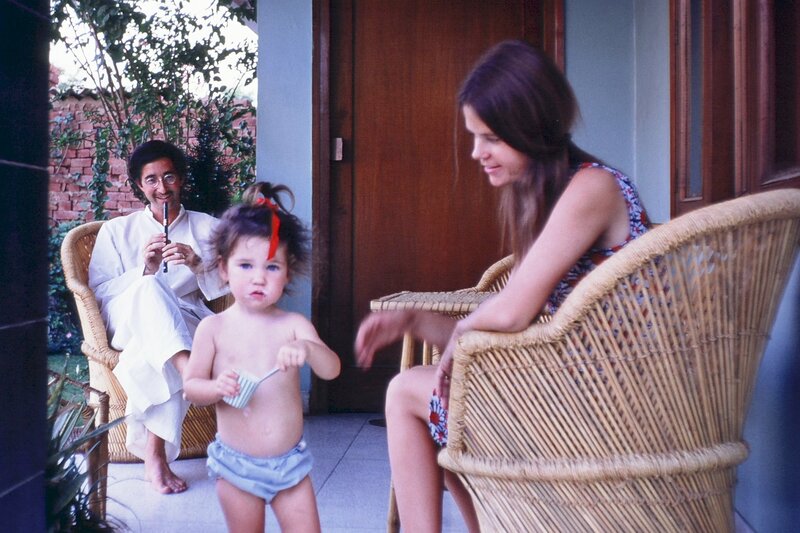 Robin and I and the first of our three children were in India in 1967-68 on the first of two grants from the American Institute of Indian Studies to study traditions of painting in Rajasthan. 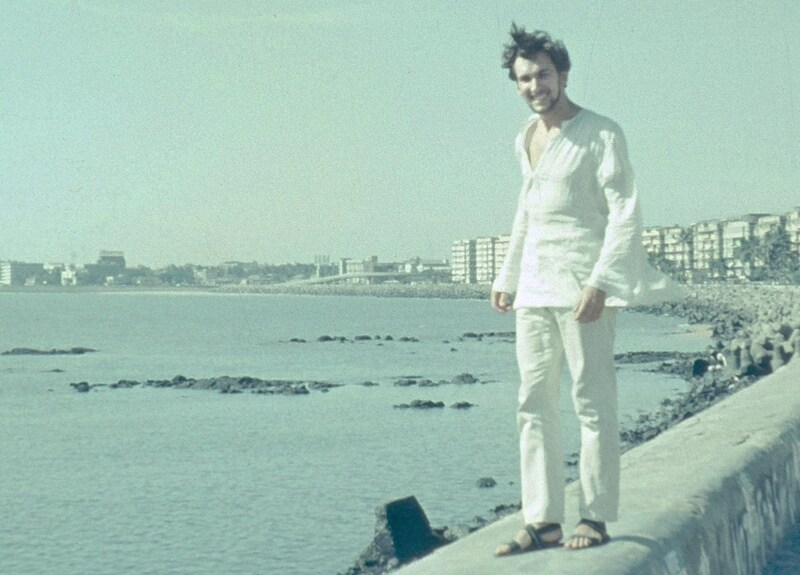 Returning to the U.S., I finished my doctoral degree and began a fifteen year period teaching at Williams College in Williamstown, Massachusetts, which included a semester in India with twenty undergraduates. Robin taught Russian and French in the local grade schools. In 1984 we moved to Washington and the Smithsonian Institution, where I became director of the Freer Gallery of Art and the Arthur M. Sackler Gallery, which together form the National Museum of Asian art of the United States, and Robin again taught, at the Washington International School. We retired in 2001, and continue to visit India yearly, usually (for me) in relation to a research and publication project about traditions of painting in India. Some fun Canadian vagabonds Phyllis (l), Claude & Inez, met Florence, later Paris. 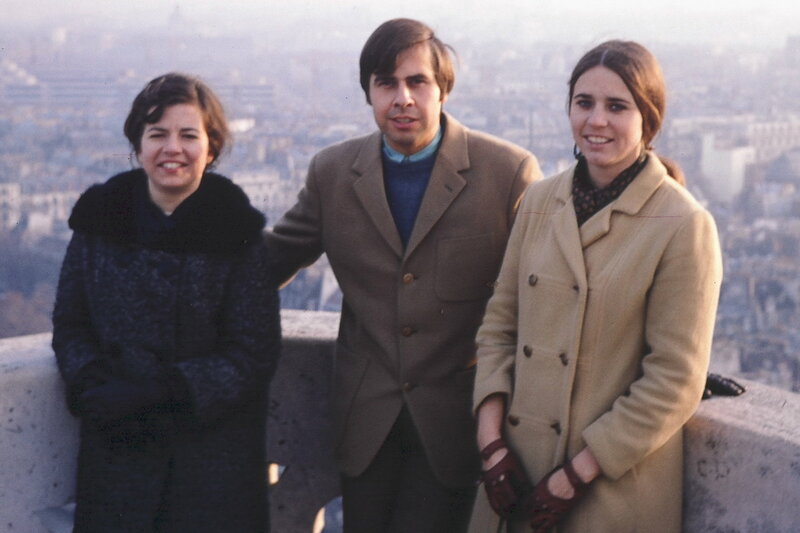 In ’68 Phyllis & I decided to go to the World’s Fair in Montreal and then head to Europe, mainly France, by boat. We had both been teaching in Uranium City, Saskatchewan for two years and wanted to travel. We decided we’d spend some time in Paris to learn or improve our French. We found a pension on the left bank & we both took classes at the Alliance Francaise. It was fun, and certainly vastly different from life in Saskatchewan. We met lots of interesting people who were also in Paris taking classes and just “seeing” the city. In Paris we ran into Claude (who had a car) and then at Christmas we all went over to Oxford, England to visit a friend of mine who was there with her husband who was on scholarship at Oxford. After that, we returned to Paris & started traveling–to Spain, Italy, Yugoslavia, Austria, Germany and Switzerland. It seems like an eternity ago but we had a lot of fun together, spent many nights sleeping in that little car, and saw a lot of Europe on not that much money and met interesting people. We were all just sort of at loose ends but wanted to see and experience Europe. When we got back to Paris (early spring…March, I think) both Claude & Phyllis returned to Canada. I stayed on, taking more classes and then returned home at the end of April (I think). Phyllis. After I got back from Europe in March of ‘68 I needed a job so I could have money for summer school to finish my standard teaching certificate. I went to Swift Current, Saskatchewan, to my sister’s to get any kind of job. I lucked out sub-teaching because my sister was a teacher but a stay-home Mom. So when they called her, I went instead and ended up getting a full time job from April to June. While I was there I met my husband, Joe Higgins, who worked for Schlumberger oil company, as did my brother-in-law. Inez. Since that time…hmmm. My husband and I separated when my 3rd child was just a baby and so pretty much since then I’ve been teaching. For many years, while I was raising my kids, I taught on a Cree Reserve in Saskatchewan, had a wonderful time & learned a lot. I still get messages from many of the students I had there and have many fond memories. I then went up to northern Saskatchewan into a metis community and would have stayed there longer but the principal of the school here in northern Quebec convinced me to come here. The school is a First Nation’s School for the Naskapi community and I’ve enjoyed my time here. We are quite far north–no roads in or out, but we have a train 2 times a week (about 17 hour trip) and we have daily air service to Sept Iles and service to Montreal 3 times a week. My family is pretty scattered. My daughter lives in Chicago with her husband, I have a son living in L.A. (Hollywood), and another son in Edmonton. Thus my trips to the U.S. are usually in the summer. Phyllis. We moved around a lot, being in the oil patch and with Joe working for numerous companies, ending up in Alberta. We had two boys close together then a girl nine years later. In 1980 we actually moved to Kansas in the U.S.; some Canadians took different service companies down there so we knew quite a　few people who went down there. We were supposed to stay for only three years but stayed for eleven. The kids wanted to stay, especially the boys, for they were already in university with full scholarship. In 1991, we went broke in the Kansas oil business in Kansas so returned to Canada, leaving the boys down there in university but taking Jolene, our daughter, back with us for she was only in the 8th grade. After a few years Joe got into business for himself and I went back to the university for 2 1/2 years (I had to drive 2 hrs. one way) to get my teaching degree. I started back teaching full time in 1995 and am still teaching but am retiring this year (2008). Our oldest son, Tyler, is an engineer in Denver, CO, is married and has two children. Our second son, Rylan,　is a university professor in Ho Chi Minh City*, Vietnam, and is married to a Vietnamese girl. We visited there for 3 weeks last Christmas. They are coming back to Canada next fall to live. We live in Brooks, Alberta, Canada. Joe sold his small company and is retired. We intend to start traveling when I retire even though we have traveled quite a bit because of our children being all over the place. * Note from Tom. Ironic, as in 1968, Ho Chi Minh City was known as Saigon, the site of my brief visit there in May 1968. I think I always had an interest in India and Indian culture. In 1968 after being an actor for four years, on tour and in different theatres, I bought my first 16 mm film camera. A journalist friend of mine – Bo　- stationed in Istanbul called one day and asked if I would like to accompany him and his newly-found Canadian girlfriend Margaret to India. Three days later I was on my way with ten rolls of film and a ticket from Stockholm　to Erzurum, close to the Iranian border. Eventually I found them scary when some of them, because of my name and looks (I wore a white kurta pajama), started to talk about me as a possible incarnate Jesus. When they provided me with the Tibetan Book of Death I found it wise to withdraw from their attention before they might nail me up somewhere. One day when I was sitting in the Royal Park preparing my filming, a well dressed gentleman came slowly strolling alone. I recognized him immediately from the statue in the city crossroad junction. It was King, Mahendra himself, accompanied only by two civil guards in a distance. He stopped, adjusted his over-proportioned goggles and looked at me. I jumped up and went into my former role as an officer of the Swedish Commandos, with heels together and a deep bow. He looked somewhat surprised, not expecting this from　a foreigner in a kurta and he gave me a friendly smile and asked me who I was. I told him my name and that I was a Swede coming to experience his beautiful country. I deliberately did not mention my film plans, knowing that might be a delicate matter. The cold war was hot at the time, The U.S. had a “weather station” up north where the Chinese were patrolling, aiming at anything that moved, and the Peace Corps were, among the natives, considered the prolonged arm of the CIA. I started shooting my film, trying to find the soul of the people living along the river, the monks of the monkey temple on the hill as well as some wild life. Unfortunately all my exposed film was confiscated at my departure. OK! I didn’t want to swim too far out, away from my personal belongings on the shore, especially not with a guy sitting a little bit too close to them for comfort. Was he expecting me to drown? Back at the hotel there was a new guy at the desk. When he saw me, still dripping with water, he rolled his eyes:” Where have you been, sir?” he asked. I had a lovely stay with Lakshmi, her mother and two sisters, one a singer, the other a lawyer. There were private concerts, excursions and a beauty contest disguised as a fashion show and organized by Lakshmiì’s entourage – which she of course won! My remaining film was used on her dancing. On the train again, this time I arrived at Bombay. There I made the mistake of getting a piece of chocolate in the street. After 3 days between bed and toilet I was fully prepared to leave this world, when as a strike of lightning, I felt perfectly all right again and stronger than ever. At the time, there was a movement trying to make people give up English in favor of Hindi. Big signs were everywhere stating TALK HINDI. Asking two guys for the way to the beach, they pretended not to　understand. When mocking them with my best gibberish Hindi, however, they couldn’t help laughing and they showed me the way in perfect Indian English. It was at the beach I met with Tom Leech, a most friendly, nicely-educated guy from La Jolla, California. We had a long stroll together, exchanging angles on the big issues of life. As customary when you leave a person you like, we promised to keep in touch. Back home we exchanged a postcard or two, before life went on in new directions. In my case that meant teaching theater and acting on stage and in TV. In 1975 I started my own film company and made some documentaries and short features. Together, with a Japanese company, I made four full length features – three love stories and one action. All were with Swedish actors and dubbed into Japanese. Together with three colleges I made a guest performance at Largemont Hall in Los Angeles. The humoristic play was “Market Eve” by Swedish author Vilhelm Moberg. That also gave me an opportunity to attend classes and give a speech at the Actors Studio. I met many nice people like Martin Landau and his wife; Alf Kjellin,(under the artist name of Christofer Kent), director of most of the Bonanza episodes and neighbor of Marlon Brando; and the charming actress Signe Hasso, who used to be a close friend of Swedish actress Greta Garbo. In the ‘80ìs I had the pleasure of introducing Russian-American writer and good friend Joseph Brodsky to our Royal Dramatic Theatre. He got the Nobel Prize in 1987 and became head of the Library of Congress two years later. He loved Sweden and occasionally came here to sail with me. Unfortunately he died from a heart disease and is now buried in Venice. It’s now 21 years ago that I met my soul mate,　Kunnie Topden, an exceptional, extraordinary girl from the Kingdom of Sikkim, now annexed by India. She comes from a prominent family with an interesting background　of three reincarnations in her family: her brother, her maternal uncle’s son, and her maternal aunt’s husband. Her brother has left the monastic life but is still revered by his followers. His monasteries in Dharamsala & Kathmandu are run efficiently by his people. We hope, one day, to visit his monastery in Tibet. Together we founded SIFA, the Sweden India Film Association, to establish co-operation between our countries in the film field. As India now is the biggest film nation in the world, and with the advantage of Kunnie’s vast contact net, we just couldn’t resist trying to link with them. In 2004 we got her film-making friend, Romesh Sharma, to place his up-coming production, “Follow Your Heart” in Stockholm. He engaged his old friend, the super star, Amitabh Bachchan, supposedly the highest paid actor in the world, who made this as a gesture of friendship. I also had a role in the film. Last autumn we arranged the first Indian Film Festival in Sweden, with help from the Indian Embassy and private sponsors. The guest of honor was our old friend Dev Anand, now 84 and legendary superstar, director and producer since 1946. The opening film was “Gandhi My Father” followed by a series of recent successes. This year we don’t have the funds to follow up, unfortunately. For the last 14 years I have also run my theatre company, Konferensteatern, which to date has produced 1000+ shows for companies and conventions. I also have a conference centre of my own in a picturesque village not far from town. Even that has a connection to India as it　used to serve as an ayurvedic centre. Here I can gather friends and colleges and in the future, hopefully, some Indian film teams. I have visited different parts of India many times over the years; once on motorbike around the south, once acting in a film in Hyderabad and, since the film festival started in Goa, I have attended every year and hopefully will do so even this year. In short we are leading an interesting life, traveling a lot and　enjoying new sites and new friends. Life is worth living !